I THOUGHT I was only going to create one design for Valentine's Day, but I came across a couple of cupid graphics that inspired me. I decided to do a PDF Valentine Set for the etsy shop. I tried to make them flexible to use. The PDF files all printed out. Everything cut up and ready to give. Each little Love Note is for writing something you love or appreciate about someone. Similar to the Bucket of Love concept, but instead of having all the notes in one place, I like the idea of hiding them all over the place so they can be found for days on end. 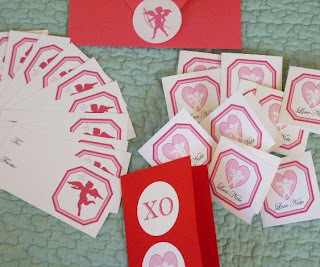 The Petite Valentines are for using as gift tags (maybe with a Hershey Kiss taped to it?) or punch a couple of holes in it and "weave" a lollipop through. 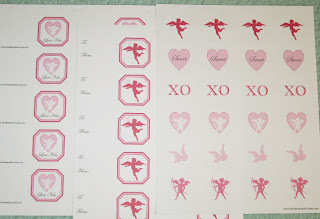 The labels are just for fun; sealing envelopes, decorating a package or making Valentines with.